When used unqualified, the term most commonly refers specifically to the palatine tonsils, which are masses of lymphatic material situated at either side of the back of the human throat. 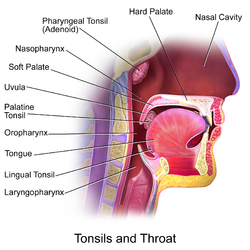 The palatine tonsils and the nasopharyngeal tonsil are lymphoepithelial tissues located near the oropharynx and nasopharynx (parts of the throat). Normally, each tonsil measures up to 2.5 cm in length, 2.0 cm in width and 1.2 cm in thickness. 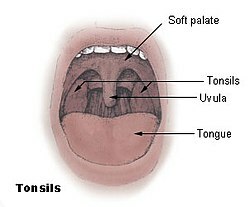 Humans have four tonsils: the pharyngeal tonsil, tubal tonsil, palatine tonsil, and the lingual tonsil. These immunocompetent tissues are the immune system's first line of defense against ingested or inhaled foreign pathogens, and as such frequently engorge with blood to assist in immune responses to common illnesses such as the common cold. Tonsils have on their surface specialized antigen capture cells called M cells that allow for the uptake of antigens produced by pathogens. These M cells then alert the underlying B cells and T cells in the tonsil that a pathogen is present and an immune response is stimulated. B cells are activated and proliferate in areas called germinal centers in the tonsil. These germinal centres are places where B memory cells are created and secretory antibody (IgA) is produced. Recent studies have provided evidence that the tonsils produce T lymphocytes, also known as T-cells, in a manner similar to the way the thymus does. The many but small side effects of having tonsils are bleeding of the tonsils, chronic tonsillitis, and other rare diseases of the tonsils. Many of these symptoms are the common ailment to why many doctors recommend a tonsillectomy on their patients. ^ "the definition of tonsil". Dictionary.com. Retrieved 2017-01-29. ^ a b "The Lymphatic System". act.downstate.edu. Retrieved 2017-01-29. ^ Chapter: Ear, Nose and Throat Histopathology in L. Michaels (1987). Normal Anatomy, Histology; Inflammatory Diseases. Springer London. ISBN 9781447133322. ^ "Definitive pharynx; Thyroid; Miiddle ear; Tonsills; Thymus". www.embryology.ch. Retrieved 2018-10-15. ^ "Tonsils Make T-Cells, Too, Ohio State Study Shows". Ohio State University. Ohio State University, Comprehensive Cancer Center. March 4, 2012. Retrieved March 27, 2014. ^ "Tonsillectomy - Mayo Clinic". www.mayoclinic.org. Retrieved 2018-10-11. ^ Ezzeddini, R; Darabi, M; Ghasemi, B; et al. (2012). "Circulating phospholipase-A2 activity in obstructive sleep apnea". International Journal of Pediatric Otorhinolaryngology. 76 (4): 471–4. doi:10.1016/j.ijporl.2011.12.026. PMID 22297210. ^ "Tonsils | Tonsilitis | Lymph Nodes | MedlinePlus". Retrieved 2017-01-29. ^ Mora, R; Jankowska, B; Mora, F; Crippa, B; Dellepiane, M; Salami, A (2009). "Effects of tonsillectomy on speech and voice". J Voice. 23 (5): 614–8. doi:10.1016/j.jvoice.2008.01.008. PMID 18468843. ^ Wang, JH; Chung, YS; Cho, YW; Kim, DY; Yi, JS; Bae, JS; Shim, MJ (April 2010). "Palatine tonsil size in obese, overweight, and normal-weight children with sleep-disordered breathing". Otolaryngology–Head and Neck Surgery. 142 (4): 516–9. doi:10.1016/j.otohns.2010.01.013. PMID 20304270. This page was last edited on 17 March 2019, at 14:34 (UTC).